A very important part of a Windows-based handheld, as with Windows itself, are of course the applications. As this is a review of Windows Mobile 5.0 we will be sticking with the applications that Microsoft ships with the OS. 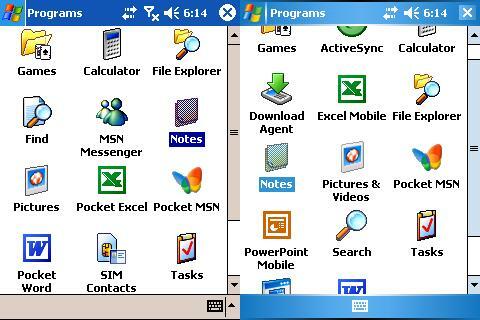 As you can see, there are a several additions: PowerPoint Mobile and ActiveSync. Then of course we have a few name changes, notably Pocket Word becomes Word Mobile, Find becomes Search, etc. PowerPoint Mobile is a much needed addition that allows you to view – but not edit – presentations. So if you receive a presentation as an email attachment, no problem. Now you can view it – complete with most of the animations you would get on the desktop version. So as you can see from the screenshots, it is about what you would expect for a mobile presentation viewer. This could be very useful for owners of 640x480 handhelds, as you could certainly give a compelling presentation with just your handheld. It makes a competent viewer, however, as you will probably not typically edit complex documents on the handheld anyway.